Cardiopulmonary resuscitation (CPR) cracks ribs and induces vomiting, so it’s best not to practice on live humans. Luckily, CPR dummies take the beating, so your students don’t have to. If you aren’t sure which dummy is best for you, you’ve come to the right place. There’s a dummy for every occasion, and we’ve sorted out the best just for you. What makes a good CPR dummy? CPR has two parts, chest compressions and rescue breaths. For training purposes, a good CPR dummy should have both compressions and breaths. Some manikins are only capable of chest compressions, so watch out for that. Besides the bare minimum, newer CPR dummies have audio and visual feedback to quickly teach trainees proper compression depth, hand placement, rescue breaths, etc. As a teacher, it is tough to describe how far or hard to compress the chest because usually there are too many students and none of them knows how far two inches is. The fact is, audio-visual feedback helps produce better life savers. Good quality chest compressions are the most important part of CPR, so many dummies have a built in clicking noise that lets the user know when compressions are deep enough. Besides audio feedback, visual indicators also help students learn proper technique for both chest compressions and rescue breaths. If you are on a budget, you can still get a CPR dummy that provides all the basic necessities and feedback responses without breaking the bank. The Nasco CPR Prompt Manikin is one of the cheapest basic dummies that meets the basic requirements for CPR instruction. Pros: Inexpensive. Has anatomical features for correct hand placement. Produces an audible click when compressions are done properly. Can set the chest springiness to adult or child. 5-year warranty. Many users find the adult setting difficult to compress. This is not necessarily a con because weak compressions are a much larger problem than compressions that are too hard. It is better to have students train on hard mode. 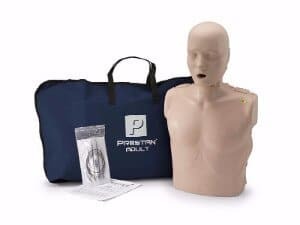 For those with a slightly higher budget, the Prestan Professional Adult CPR and AED Manikin is a high quality CPR dummy that provides valuable audio-visual feedback and has features that at least try to be life-like. Pros: Visual LED compression rate monitor. Audible click for proper compression depth. Chest rises and falls with proper rescue breaths. Rubber skin makes good BVM seal. Easy setup. Cons: Not suitable for jaw thrust maneuver, only head-tilt chin lift. 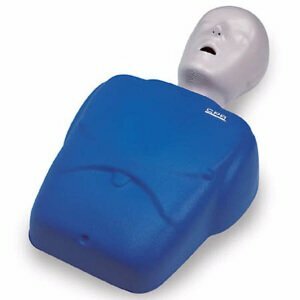 For all around functionality and ease-of-use, this CPR dummy cannot be beat for the price. It does not have some of the more advanced features that come with high-end models, but for the average CPR class these will work just fine. If you have limited space or the classroom is 10 flights of stairs above the storage room, a portable set of CPR dummies can be a valuable purchase. With Prestan Ultralite Manikins, you do not have to sacrifice quality for portability. Pros: Lightweight and stackable for easy storage and transportation. Realistic head-tilt chin lift. Chest rises when used with lung bags. Thoughtful, intuitive design. 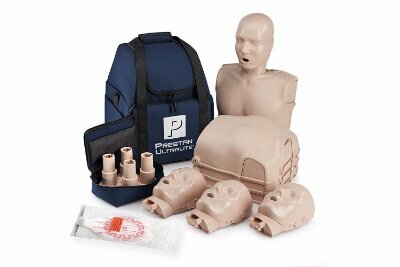 The Prestan Ultralite Manikin is a superb portable CPR dummy with a solid design, great features, and a durable build. Unfortunately, it lacks audio-visual feedback for compressions, so it will never be as good as the Prestan Professional Adult CPR and AED Manikin. Dog CPR dummies are available to teach pet owners how to perform life-saving CPR on animals. Simulaid’s CasPeR the CPR Dog has all the necessary features to ensure that the trainee learns the correct procedure for dog CPR. Pros: Tongue and jaw move for clearing airway. Varying strength femoral pulse can be created with included squeeze bulb. Accurate anatomy for mouth-to-snout rescue breaths and hand placement. Chest rises and falls with rescue breaths. Cons: No audio-visual signals for good compressions. 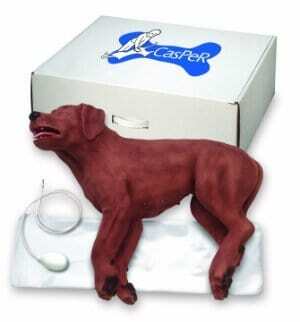 Dimensions: 27" x 9" x 22"
CasPeR the CPR Dog provides realistic canine CPR practice at a reasonable price. The CPR dummy dog has all the features necessary to teach basic CPR. Along with CPR, AED trainers will give students the full experience of responding to sudden cardiac arrest, and AED trainers are common add-ons because they are necessary for CPR certification classes. The WNL Practi-TRAINER Essentials kit has standard buttons and cues to walk students through using a AED or portable defibrillator without being able to provide an actual shock. Pros: Inexpensive. Replacement pads are also inexpensive. Uses standard AAA batteries. Cons: Thin wires are easy to rip off pads. If you use a specific type of portable defibrillator, you might want to purchase the trainer of the same type for more accurate simulation. Usually though, a general trainer is much cheaper and still has good teaching value. 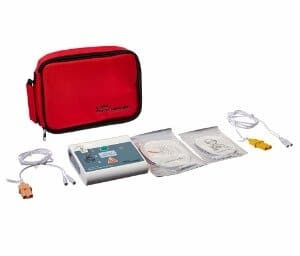 The WNL AED Practice Trainer comes with all the necessary equipment for defibrillator practice at an affordable price. The NASCO CPR Prompt Manikin is a cost-effective, functional dummy that is good for beginners on a budget. It works well for AED training, OK for chest compressions, and poorly for rescue breaths. The Prestan Professional Adult CPR and AED Manikin dummies are great CPR trainers because they are good quality, functional without too many bells and whistles, and have a middle-range price. Prestan Ultralite Manikins are great if you need a lightweight CPR dummy that doesn’t take up much space, but it does not give compression feedback. Simulaid’s CasPeR the CPR Dog is one of the best dummies on the market for basic dog CPR, although it does not give compression feedback. If you need an AED Trainer to go with your dummy, the WNL Practi-TRAINER Essentials kit is a cost effective way to teach AED use during CPR. Yeung, Joyce, et al. "The use of CPR feedback/prompt devices during training and CPR performance: a systematic review." Resuscitation 80.7 (2009): 743-751.